With reference to the above, herewith please find a report of my investigation and conclusions (or opinions). After telephone conversation with you and later with Dr. Ebbs, I met Corporal Rodger near Algonquin Park on October 5, 1956. His report of October 9, 1956 covers what we did on that day. Corporal Rodger and I decided that, to protect ourselves from criticism re opening a grave, we would proceed as a routine case of reported finding of human bones to establish if possible their identity with some missing person and the possibility of foul play but that we were not concerned with local rumours of it being Mr. Thomson the artist, except as a possible identification. From subsequent events it would seem we have been criticized. Observations at site of unmarked grave. grave showed pickets rotted at the ground level so a wooden marker could have disappeared from this grave. I saw no stone marker for this grave. Remnants of wood, metal handles and plates were at the same level as the bones. The original diggers at one corner had found wood first, then bones. These facts suggests the body had been in the coffin. I did not feel that this was necessarily so as, if the body had been placed on top of an empty coffin it would fall in if the top rotted before complete rotting of the sides occurred. The wood appears to be a coffin with canvas and a roughbox. Only rotted pieces remain. If the body was buried in the coffin this suggests it was not a secret burial. The coffin appears to be too expensive for an Indian or casual worker such as a lumberjack. Sifting the contents showed up no rings or buttons. Only fragments of the canvas covering were found. Part of a sock remained on one foot. No mocasins were seen. So the body was buried naked, except for one sock, or in a shroud without buttons. Length of time buried: It is impossible to be definite about this. The bones are so light (from loss of calcium) that burial could be 20 to 40 years and even longer. Had the body been embalmed and buried for 40 years, as in Thomson case, I would expect some remnants of flesh. There were none. Identifcation: The bones were definitely male. Calculations from humerus, femur and tibia gave an estimated height of 5’8” plus or minus 2”. These bones suggested also a robust, well muscled person. The sutures in the skull give an age of 20 to 30. The absence of caries in the teeth (all present except one lower molar which was broken off) also suggests an age less than 30. It was not possible to determine if the man was a pipe smoker. Professor J.C.B. Grant, Department of Anthropology, University of Toronto, was consulted and he gives as his opinion that the skeleton is that of a male, strong, height 5’8” plus or minus 2”, age in late twenties and of Mongolian type, either Indian or nearly fullbreed Indian. He could not give any estimate of length of time buried. operation of trephining of the skull for haemorrhage following a head injury. Final X-rays, after removal of skull cap prove to the radiologist and to me that it is a surgical trephine opening and not due to bullet, or sharp instrument such as a pick or arrow. Mr. Thomson is described in books etc as a strong outdoor type over 6 feet in height, and 40 years of age. Mention is made that he was a pipe smoker. The bones were of a shorter man of lesser age. The bones belong to an Indian. I find no notes of Mr. Thomson’s ancestry except that he was born in Claremont, Ontario. Inquiries are being made. The skeleton had exceptionally good teeth with a characteristic irregularity in the lower jaw. 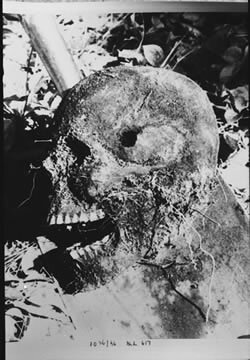 Pictures were given to Inspector McDermott to see if the relatives recognized this. He could have been buried without clothing as he was found several days after his death. But it is also stated that he was embalmed so he was not necessarily too unpleasant to dress. Also, if he were embalmed I think some fleshy portion would have remained even after 40 years. The records available show that Mr. Thomson was bruised on the right side of the face. This is in Dr. Howland’s description and one of the undertaker’s. Mr. Little (of the original group) is not sure he hasn’t read somewhere it was on the left side. Dr. Howland was an old teacher of mine and a neurologist. He was such a good observer, he would not have missed a wound on the left temple and the hole in the skull, if fresh, must have had a face wound, if old, a noticeable scar. The foot of the grave in which the bones were found was 21 feet due north of the corner of the fence surrounding the two marked graves. This is certainly approximately where Mr. Thomson was buried originally. There is nothing to prove that the opened grave is not the same as Mr. Thomson’s and the coffin is hardwood just as his was said to be. But I feel definitely that the skeleton is not that of Mr. Thomson. I do believe, however, that this Indian was buried in Mr. Thomson’s original grave, either in or on top of his empty coffin. The only way to stop these rumours is to open the grave at Leith and, if the family are satisfied he is buried there, this can never be done. Inspector McDermott may have some information re his height and weight, what he was wearing when buried, any history of head injury or operation in earlier life and if his pictures of the teeth were recognized by relatives. The bones found were those of an Indian or nearly full breed Indian, male, about 5’8” tall, robust in stature, aged in late twenties. He has been buried for 20 years at least, more likely 20 than older. At some time he likely had an operation on his head for haemorrhage following a blow. This injury may have been accidental or otherwise; it is impossible to say. However, no charge was apparently made at the time of operation. He was buried probably naked except for one sock, in or on top of a coffin which appears to be too expensive for his race. Being Indian, he could easily have been near this place at death; this small burial place seems well known; it is suggested that the easier way of digging into a known grave might occur to his companions or it might be to disguise the presence of a fresh grave.